Single (Long) 30" x 80"
Single (XL) 30" x 84"
Twin (Long) 38" x 80"
Twin (X-Long) - 38" x 84"
Double (Full) - One Control 54" x 74"
Double (Full) - One Control - Long 54" x 80"
Double (Full) - One Control - X-Long - 54" x 84"
Double (Full) - Dual Controls 54" x 74"
Double (Full) - Dual Controls - Long 54" x 80"
Queen - One Control 60" x 80"
Queen - Dual Controls 60" x 80"
Queen (XL)- Dual Controls 60" x 84"
King (XL)- Dual Controls 76" x 84"
King - Dual Controls - 76" x 80"
CA-King - Dual Controls 72" x 84"
Please make sure you measure your bed before you buy (Note: Single size is smaller than a twin size mattress). This high quality USA made heated bed warmer creates the warmest heat of any other product that we have ever tested in a heated mattress pad. The Digital Comfort Controls regulate the heat you select. 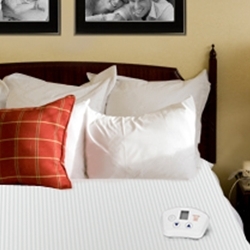 Dual control units regulate the heat on your half of the bed. Made from two sheets of fine weave, 100% polyester cloth quilted together, similar to a high quality mattress pad. The closely quilted seams form tunnels, and hold the heating element wire inside for uniform heat distribution. All styles are padded with bonded polyester fill.